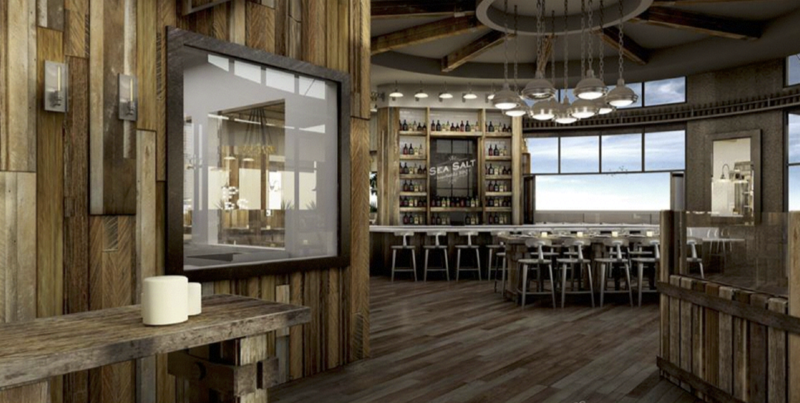 Updates: SeaSalt Woodfire Grill opened for business on April 27, and opened for lumberjack-style weekend breakfasts on June 11 (Saturdays and Sundays, 8 a.m. to 2 p.m.). The hospitality team behind Huntington Beach's award-winning SeaLegs Wine Bar is shaking up the Orange County culinary scene once again—or should we say shaking a little salt onto it. Come fall 2015, the same plaza housing the wine bar will welcome a fresh "farm-to-fire" concept called SeaSalt Woodfire Grill, honoring California's Central Coast. Borrowing from 19th century Santa Maria-style live-fire barbecue, SeaSalt's menu features smoky, hearty flavors of meats, seafood, and veggies cooked over red oak coals on a window-front woodfire grill and sprinkled with housemade sea salts. To further spice things up, diners will choose the artisanal sea salt for their dishes, perusing choices like garlic, lemon, and bacon. SeaLegs' Chef Alexander Dale stands proudly behind the shaker. "Pitmasters' live-fire grilling of local cuts of meat and seasonal vegetables is a quintessential Santa Maria tradition," explains Owner Alicia Whitney, adding, "Our concept is to create a dining destination in Orange County that evokes this experience." SeaSalt will do so by keeping it simple—it being flavor. Guests will realize the natural flavors of meats like bold-and-robust bone-in ribeye steak, traditional tri-tip, lamb chops, and linguiça sausages, all grilled by pitmasters over an open fire and elevated with sea salts, black pepper, and other simple seasonings. Seasonal sides will be plucked from local farmers markets, further awakening the tastes of early pioneer cooking. Dinner will be served daily, along with lumberjack-style breakfasts every weekend. "The resulting taste is unbelievable and nothing Orange County restaurants offer now," says Whitney, owner of SeaLegs Wine Bar, of the approach. It's also a smart nod to Huntington Beach's famed fire pits, which sit less than a mile from the Beach Boulevard and Atlanta Avenue eatery. Savory and sweet sea salts will also grace the rims of specialty "craft rim" cocktails, but SeaSalt won't stop pouring there. The wine menu will be exclusive to nectar from the Santa Maria region, and local craft beer will also be on tap. SeaSalt's design mixes modernized rustic farmhouse with Central California hitching post. Think exposed wood logs, high ceilings, wagon wheel lighting fixtures, country earthenware, mismatched utensils, and peek-a-boo views of the Pacific Ocean. Outdoor seating looks to be on the menu. It all sounds tastefully nostalgic, and we can't wait to pair Huntington Beach's salty sea air with some SeaSalt. Follow SeaSalt on Facebook and Instagram.